The second series of euro banknotes has been in circulation since 2013. The new banknotes have high technology security features that have been created using the latest technical equipment. The new security features are more effective and offer better protection against counterfeiting. The new notes continue the theme of “ages and styles”. The 200-euro note shows architecture from the age of iron and glass in the 19th century. · a portrait window of Europa above the hologrammic strip, where a portrait of Europa appears that can be seen from both sides of the note when it is held up to the light. 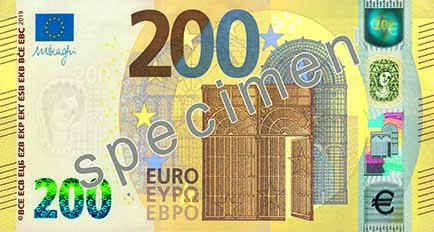 The new 200-euro note is the same width as the note of the first series, but it is a little less high. 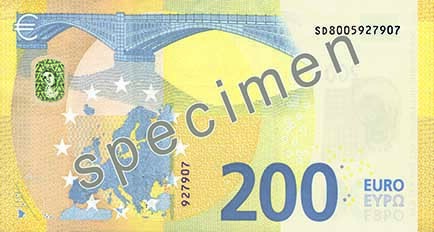 The dimensions of the 200-euro note of the second series are 153 mm x 77 mm.